Open Forum: In an attempt to promote free and open discussion of issues, Agrichemical and Environmental News encourages letters and articles with differing views. To discuss submission of an article, please contact Dr. Allan Felsot at (509) 372-7365 or afelsot@tricity.wsu.edu; Dr. Catherine Daniels at (253) 445-4611 or cdaniels@tricity.wsu.edu; Dr. Doug Walsh at (509) 786-2226 or dwalsh@tricity.wsu.edu; Dr. Vincent Hebert at (509) 372-7393 or vhebert@tricity.wsu.edu; or AENews editor Sally O'Neal Coates at (509) 372-7378 or scoates@tricity.wsu.edu. EDITORIAL POLICY, GUIDELINES FOR SUBMISSION. Since the passage of the Food Quality Protection Act (FQPA) of 1996, use of pesticides in orchard crops has come under heavy scrutiny due to the new set of rules and standards for assessing the risks of pesticide exposure. In the state of Washington, this impacts an industry with an estimated farm gate value of $988 million and approximately 214,400 acres of apple, pear, and cherry (WASS 2000). To date, the result of FQPA has been either an outright loss of pesticides (e.g., methyl parathion in 1998), restrictions affecting use patterns (e.g., chlorpyrifos restricted to pre-bloom use only in 1999 and formetanate hydrochloride restricted to use up to the bloom period, also in 1999), or restrictions on the amount that can be used (e.g., limits on azinphos-methyl imposed in 1998). It is likely that cancellation of traditional pesticides will continue and that those that do remain will have further use restrictions placed on them. EPA is approving new pesticides for use, but these approvals often occur before scientists have the opportunity to determine how best to use the new products in IPM programs. While newer pesticides are typically safer to humans and the environment and are usually more selective, (i.e., they impact pests to a greater degree than they impact natural enemies), they are also generally less efficacious than the products they replace. The increased use of pheromones as pest control tools, replacement of organophosphate and carbamate insecticides with selective products, and enhanced impact of biological control agents combine to form the new hope for IPM programs in tree fruit crops. While great strides have been made in the last five years, as documented by the Codling Moth Areawide Management Project (Brunner, et al. 2001, Calkins 1998), the future of these kinds of programs and their stability over time remain uncertain. Comprehensive apple and pear pesticide use surveys were conducted in Washington in 1989 and 1990, respectively (Beers and Brunner 1991). The United States Department of Agriculture National Agricultural Statistics Service (NASS) initiated pesticide use surveys in 1991 and has conducted these every other year on fruit crops (NASS 1992, 1994, 1996, 1998, 2000, 2002). While the NASS surveys provide general use data for pesticides and track changes in usage over time they lack the data necessary to assess pesticide use patterns or IPM practices within individual states that was provided in the 1989 and 1990 surveys in Washington. The lack of data on pesticide use patterns and IPM practices has had many ramifications. Without data it is difficult to counter claims by anti-pesticide groups about how pesticides are actually being used. As educators needing to design and evaluate our outreach programs, it is important for us to document which IPM practices are being following over time. Establish the baseline data necessary to document changes occurring in pesticide use and IPM practices over the next five to ten years. Will pheromone-based pest control systems be sustainable over time? Will replacements for organophosphate and carbamate insecticides be effective? Will biological control provide sufficient suppression of pests in combination with “soft” controls? Will researchers be able to document changes in practices to prove one way or another which system works best? We prepared separate pest management practices surveys for apple and pear crops using the 1989 and 1990 apple and pear surveys as templates (Beers and Brunner 1991). Using the 2000 Crop Protection Guide, we updated the technical content (Smith et al. 2000). We then used the new apple and pear surveys to design a cherry survey, for which no previous template existed. Each crop survey was then reviewed by industry experts for accuracy and applicability. A standardized format was adopted for all surveys to allow for easier comparison and data entry; the format was designed to be as grower-friendly as possible. An electronic version of each survey was made available via the World Wide Web for any respondent wishing to submit the survey in that manner. Survey recipients for each of the three crops were selected at random from lists of growers and orchard managers provided by an industry organization. In early March 2001, 985 apple, 863 pear, and 499 cherry surveys were mailed. Return postage was pre-paid, responses were anonymous, and recipients were given approximately 45 days to respond. Growers answered questions based on the previous (2000) growing season. Characterization of Farming Operations: Part I of the survey directed respondents to answer questions intended to characterize their farming operations as to general location; as being full-time or part-time; and as being conventional, organic, or transition to organic. They were also asked which fruit crops and varieties, along with how many acres of each they grew. Pest Management Advice: Fruit growers in Washington receive information and advice from private consultants, agricultural chemical industry fieldmen, fieldmen employed by growers or packinghouses, and university Cooperative Extension agents. Survey recipients were asked to rate these various information sources as being “very important,” “somewhat important,” or “not important” in helping to make pest control decisions. Pest Management Practices: Washington state tree fruit growers employ a variety of pest management practices to help reduce reliance on pesticides as their sole pest control tactic. Growers were asked which practices they used including orchard monitoring, alternate row spraying, reduced pesticide rates, biological control, integrated mite management, economic thresholds, degree-day models, mating disruption, and pheromone traps. Reporting Block Information: Each grower was asked to report on a block (i.e., portion) of the farm that represented his typical pesticide use pattern. Questions included size of block, planting density, varieties planted, percentage of each variety planted, irrigation methods, cover crop management, and tree training system. Reporting of Pesticide Use: Each time a pesticide was applied, the grower was requested to report the tree phenology, date, method of application, volume applied per acre, percentage of acreage applied, chemical name, amount of formulated material per acre, and target pest. Data Analysis: Surveys were screened to eliminate incomplete, imprecise, or unanswered questions. Once screened, survey data were coded and entered into a spreadsheet for analysis. The amount of active ingredient (AI) of each chemical was determined by multiplying the amount of formulated product used per acre as a portion of pound or gallon by the pounds of AI per pound or gallon in the formulation. In this issue of Agrichemical and Environmental News, we discuss information derived from the apple surveys over the last decade. In future issues, we will discuss information derived from pear and cherry surveys. In 1989, of the 800 surveys sent to active apple growers, 358 (45%) were completed and returned. These 358 growers produced apples on 20,300 acres representing approximately 12.7% of the total acres of apples grown in Washington (WASS 1986). In 2000, of the 985 surveys sent to prospective apple growers, 170 (17%) were returned but of those only 98 (10%) were complete and usable. The responses came from eight major growing regions across the state, representing a total of 11,574 production acres, or about 6.8% of the bearing apple acreage in Washington (WASS 2001). The lower return of surveys in 2000 reflected the decline in economics of the fruit industry and general lack of cooperation experienced from such surveys. Having said this, the data collected did seem to reflect realistic trends in pesticide use and IPM practices in Washington apple production. In 2000, 70% of growers classified themselves as full-time, meaning that they derived the majority of their income from growing fruit. The remaining 30% classified themselves as part-time, deriving most of their income from off-farm activities. The average farm size of full-time growers was 131 acres while the farm size of part-time growers averaged 28 acres. The majority of the respondents (89.5%) characterized themselves as using conventional pest control practices, primarily using synthetic pesticides. The remainder used a mix of conventional and organic methods, were organic, or were transitional organic (Table 1). The most significant change from the 1989 survey was the increase in the growers involved in organic production. In 1989, only 1.4% of the growers reported being involved in organic production to some degree, while in 2000, 10.5% reported activity in organic production. These data agree with other survey results showing a rapid increase in organic apple production in the late 1990s (Granatstein and Kirby 2002). Comparison of the relative proportion of farmers utilizing different farming practices and the acreage represented for the 1989 and 2000 crop years. Potential sources of pest management information and advice and the survey respondents’ ranking of their usefulness are summarized in Table 2. Survey respondents’ ratings of the value of information from different sources in helping them arrive at pest management decisions during 1989 and 2000. 1 In the 1989 survey, percentages were calculated based on four categories: “very,” “somewhat,” and “not important” plus “no response.” These figures are shown in parentheses. In 2000, percent values were calculated for the three response categories alone; non-response surveys were deleted from the calculation. To allow for comparison, 1989 figures were adjusted to express only the three response categories. These figures (without parentheses) should be used when comparing to the 2000 responses. 2 NA = This resource was not available in 1989. 3 NR = Data not reported in 1989. A majority of growers identified professional crop consultants (private consultants, agricultural chemical fieldmen, and packinghouse fieldmen) as being “very important” or “somewhat important” resources for making pest management decisions in both years. Washington State University’s Crop Protection Guide and Cooperative Extension were identified by a majority of growers (89% and 74%, respectively) as being “very” or “somewhat” important in helping them make pest management decisions. While growers rely somewhat on their peers for information to make pest management decisions this is of lower value than that of professional crop consultants or WSU. Table 3 summarizes use of non-conventional pest management practices in 1989 and 2000. Whether conducted by the grower, fieldman, or private consultant, orchard monitoring was by far the most frequent pest management activity employed; 99% of the respondents indicated using it. Seventy-six percent (76%) of growers said they used alternate row spraying in 2000; an increase from 1989 when only 28% indicated use of this practice. Alternate row spraying is a technique frequently used in parts of the eastern United States as a method for decreasing the overall amount of pesticide applied (Asquith and Hull 1979). Reducing pesticide rates is a common practice in tree fruit pest management and, along with the choice of more selective chemicals, helps conserve certain beneficial species important in controlling secondary pests such as spider mites and leafminers. In 1989, only 54% of growers reported using reduced rates of pesticides while in 2000, 89% reported using reduced pesticide rates. Percentage of apple growers using a non-conventional pest management practice to some degree. 1 NR = Data not reported in 1989. There was also an increase in the percent of growers reporting the incorporation of economic thresholds into their decision making for pest control with 92% of growers reporting its use in 2000 compared with only 37% during 1989. This increase may be due to more and better information about treatment thresholds for the pests as well as increased pest monitoring. In 1989 only about two-thirds of the growers reported using pheromone traps while in 2000 this had increased to 93%. Biological control use increased as well, from 34% to 81% over the decade. Two questions were asked in the 2000 survey that were not asked in 1989. Degree-day models were used by 92% of growers and 71% reported using integrated mite management. The results of the pest management practices section of the survey show that Washington apple growers are using more IPM practices than a decade ago and that the percentage of growers using IPM practices is in the mid-nineties. Summary of mating disruption use replies by apple growers. How did the # of mating disruption acres change from first adopting its use? New to the 2000 survey were questions about growers’ use of mating disruption for the control of codling moth. This tactic was not available in 1989. Mating disruption has been used commercially in Washington since 1991, and while the general assumption was that its use had grown, data supporting this was limited. Growers were asked if they used mating disruption in their reporting block during the 2000 crop season and if their overall use of this tactic had increased, decreased, or stayed the same since they first began using it (Table 4). To gain insight into how the growers perceived their pesticide usage over the previous five years (1996-2000), we asked whether their pesticide use had remained about the same, increased, or decreased. Six percent (6%) reported an increase in pesticide use, 61% a decrease, and 29% no change. These responses differed from those of the 1989 survey where 17% of the growers reported an increased usage, only 27% decreased usage, and 56% stated that usage had remained the same over the five-year period from 1985 to 1989. Growers were asked to indicate the pest target for each of their chemical applications. They were given a list of targets categorized as insect/mite or disease. Table 5 summarizes grower responses. Codling moth was the most frequently cited insect pest; 69% of respondents cited it as a target of an insecticide application and average of 2.8 times during the year. However, this was a reduction from 1989, when 96% of the growers cited this pest as a target of an insecticide application an average of 3.2 times during the year. Leafroller had increased as a pest. In the 1989 survey, it was cited an average of 1.3 times by 30.7% of the growers, but in 2000 it was cited an average of 2.0 times by 71.7% of growers. San Jose scale was cited an average of 1.0 time by 79% of growers as a target of pesticide application in both surveys. Aphids were less cited as a target of a pesticide application in 2000 (1.6 times by 82.5% of growers) compared to 1989 (1.6 times by 81.8% of growers). Spider mites were identified as a target of a pesticide application fewer times in 2000 (1.1) compared to 1989 (1.5) but by a slightly higher percentage of growers (29.4% versus 22.1%). Leafhoppers were cited by fewer growers and less times as a target (15% and 1.2 times) in 2000 compared to 1989 (47.2% and 1.8 times). The number of times other insect or mite pests were cited as a target of a pesticide application and the percent of growers citing them was about the same in 2000 as in 1989. Number of times growers cited a pest as a target, % who said a pest was a target at least once, and percentage of acreage represented by growers who said a pest was a target at least once. The disease most cited as a target of pesticide applications in 2000 was powdery mildew with 77% of the growers citing 2.6 applications during the season. This was much higher than in 1989 when only 36% of growers cited it as a target of pesticide applications an average of 1.5 times. Apple scab, a disease in Washington associated with wetter-than-normal years, was cited by fewer growers as a target of a pesticide application in 2000 (18.8%) than in 1989 (32.7%) though the average number of times it was cited was about the same in both years. Fire blight was not even identified as a disease in the 1989 survey because most apple cultivars grown at that time were not susceptible. With the planting of new varieties during the 1990s, 11% of the growers identified this disease as a target for pesticide applications. A frequent criticism of agrichemical programs is that applications are made too close to harvest, increasing the possibility that toxic residues could be left on the fruit. Table 6 summarizes the average last spray date for each class of pesticide used in apple orchards along with the range of when those dates occur. In Washington the apple harvest does not usually begin until late August for the earliest varieties and is usually at its peak from mid-September through mid-October with some later maturing varieties being harvested into November. The average last spray dates for insecticides (which are probably of greatest concern regarding toxic residues on fruit) are more than a month prior to the initiation of apple harvest. Some insecticides were applied in mid-August, but these were applied to late-maturing varieties whose harvest would occur in October or later. Fungicides that are predominantly applied for powdery mildew or apple scab have the earliest average last date and absolute last date of application. Average and range of last application date for each chemical class during 2000. Harvest generally begins in late August and peaks mid-September to mid-October. Nutrients are commonly included with pesticides targeting insects or disease organisms, or are applied late in the season to help enhance fruit quality, therefore the average last application date for nutrients falls between that for insecticides and fungicides. Plant growth regulators (PGRs) are typically applied for two reasons: to thin fruit or to enhance harvest quality of fruit. Most of the fruit thinning applications are applied within 30 days of bloom (as early as May 16) while fruit quality applications tend to be made closer to harvest (as late as September 5). Eight-five percent (85.2%) of agricultural chemical applications are made to the entire block. Some (4.5%) growers are making applications to half the orchard, probably as alternate row spraying. Border applications (2% of all applications) are used primarily to diminish pest problems from outside sources, such as abandoned orchards or native habitats from which pests (e.g., stink bugs) invade. Air-blast sprayers are the most common method of applying pesticides (98.5%), except for herbicides, which are applied by boom sprayer. The volume of water applied varied considerably. Most applications (64%) were made with between 100 and 200 gallons of water per acre. Higher volumes of water tended to be associated with early season, especially pre-bloom, applications. Only a few growers (11%) that used mating disruption also used the full label rate of pheromone dispensers and these were more likely to be organic growers. Most growers (59%) applied half the label rate of mating disruption dispensers. The 1989 and 2000 survey results for insecticide and miticide usage are shown in Table 7. Since 1989 there have been numerous changes in the availability and allowed usage of insecticides and miticides. Most notable is the loss of ethyl parathion (Parathion), methyl parathion (Penncap-M), phosphamidon (Phosphamidon), and propargite (Omite). Greater restrictions have been placed on the annual amount allowed or the re-entry intervals of certain insecticides, especially azinphos-methyl (Guthion); such actions have contributed to reduced usage. Comparative summary of insecticide and miticide use on apple in the 1989 and 2000 crop seasons. 1 Lbs reported are based on average active ingredient in the different Bt products used, including: Condor, Deliver, Dipel, and Javelin. 2 NA = Not applied during that crop year. Horticultural mineral oil accounted for 82% and 89% of pounds of active ingredient (AI) of all pesticides in 1989 and 2000, respectively. This occurs because of the way the AI for oil is calculated. Each pint applied is considered to be equal to one pound of AI so an application of 4 gallons of oil per acre equals 24 pounds of AI insecticide per acre. One result is that the reported insecticide and miticide AI per acre for apple is very high compared to other crops simply because apple crops use a lot of oil, especially in the pre-bloom period. It is misleading in many ways to treat oil in this manner since few people would consider oil a dangerous pesticide given the way it is used in apple production. Thus, for the rest of this discussion the percent AI per year of a product will be based on a total AI of insecticides and miticides excluding oil from the total. Azinphos-methyl (Guthion) comprised about 30% of all AI (excluding oil) applied to apple in 1989 and 2000. However, the actual use of azinphos-methyl declined significantly from 1989 to 2000. The average number of applications per acre dropped from 2.98 to 2.57 but the real change was the percent of acres treated, going from almost every apple acre in 1989 (98%) to only 58% in 2000. The total pounds AI of azinphos-methyl applied to apple in 2000 based on these data was 39% lower than in 1989. Chlorpyrifos (Lorsban) was the insecticide that made up the next greatest amount of AI in both years. In 1989 chlorpyrifos made up 15.6% of all AI while in 2000 it constituted 26.8% of all AI. The average number of applications actually declined from 1989 (1.26) to 2000 (1.09), but the percent area treated increased from 56% in 1989 to 68% in 2000. Several products that constituted a significant proportion of the total insecticide and miticide AI in 1989 (carbaryl, 7.8%; phosphamidon, 10.9%; endosulfan, 12.3%; and methyl parathion, 3.6%), were either not reported as used in 2000 or AI was greatly reduced (Table 7). Those products not reported in 1989 that contributed significantly to the proportion of all insecticide and miticide AI in 2000 included kaolin (8.6%), diatomaceous earth (10.1%), phosmet (6.8%), and lime sulfur (4.6%). Reductions in the total pounds of AI insecticides from one reporting period to another can be misleading. Many products registered since 1989 are used at very low AI per acre. For example, the maximum label rate per acre for spinosad is 0.156 pounds AI per acre while it is 1.5 pounds AI per acre (ten times more) for azinphos-methyl. While spinosad was applied an average of 1.1 times to 33% of apple acreage it only constituted 0.9% of the total insecticide and miticide AI applied in 2000. Products like spinosad, tebufenozide, and imidacloprid (the primary replacement for phosphamidon in apple production) are used at very low rates of AI per acre. As pest control programs come to use these products more and more, the total AI use on apple in Washington should decline but it will also cause products like azinphos-methyl and chlorpyrifos to make up a greater proportion of the total AI of insecticides and miticides. Two products that made up a large proportion of the insecticide and miticide AI in 2000 were used primarily in organic production. These products are like oil in that they are used at a high rate of AI per acre. For example, kaolin (Surround) was applied an average of twice to only 0.8% of apple acres but because its use rate is 26 pounds of AI per application, it constituted 8.6% of all insecticide and miticide AI in 2000. Similarly, diatomaceous earth was used an average of twice on only 2.0% of apple acres, yet constituted 10.1% of all insecticide and miticide AI. It is instructive to examine the long-term changes in use of insecticides and miticides by combining data from the WSU and NASS surveys. The only common calculations between the two surveys are average number of applications of a pesticide, the percent area treated, and pounds of AI used. Table 8 summarizes data on the use of selected insecticides and miticides on apple in Washington over a twelve-year period. Data from 1989 and 2000 are derived from the WSU surveys and odd years 1991-2001 are NASS data. Comparative summary of insecticide and miticide use on apple in Washington from 1989 through the 2001 crop seasons. Petroleum oil is the basis of early season control of several pests including spider mites, San Jose scale, and aphids. Most growers use oil early in the pre-bloom period, but summer use increased in the late 1990s, as reflected in high numbers of average applications per year, especially in organic production. These data show that use of azinphos-methyl, the most often used insecticide in Washington apple orchards, increased during the early 1990s, then declined both in number of applications and area treated from 1997 though 2001. Regulatory pressures could have contributed to the reduction but it also very likely the adoption of mating disruption made the reduction in azinphos-methyl use possible. There has been a slight increase in use of phosmet (Imidan) from 1997 through 2001, suggesting that this product filled some of the azinphos-methyl gap. Chlorpyrifos (Lorsban) was first used in Washington apple orchards in the1980s as a pre-bloom control (delayed-dormant period) for leafrollers and San Jose scale. Pre-bloom use of chlorpyrifos, as well as some summer use, increased after parathion use was eliminated by regulatory action in 1993. The slight decline in chlorpyrifos use from 1997 to 2001 was due in part to the use of spinosad (Success), a product registered in 1996 for control of leafrollers, and in part to regulatory action that eliminated summer use of chlorpyrifos. Table 8 shows the effect of eliminating insecticides. Since 1989 three of the insecticides listed, ethyl parathion, methyl parathion (Penncap-M), and phosphamidon, have lost registrations on apple and chlorpyrifos use has been restricted to pre-bloom use. Imidacloprid (Provado) replaced phosphamidon as the primary control for aphids in apple orchards. Fungicide usage during 1989 and 2000 is compared in a table on the WSU Pest Management Practices Survey 2000 Results Website (http://opus.tfrec.wsu.edu/~wjones/Survey2000/ ). Some of the results showed that as of 2000, the dithiocarbamate compounds metiram (Metiram, Polyram) and oxythioquinox (Morestan) became unavailable. However, they were replaced by fosetyl-al (Aliette), kresoxim-methyl (Sovran), oxytetracycline (Mycoshield, Terramycin), propiconazole (Orbit), thiram (Thiram), trifloxystrobin (Flint), and triflumizole (Procure). Although dinocap (Karathane), dodine (Syllit), and triforine (Funginex) were available, there were no reported uses in the 2000 survey. In addition to the loss of some chemicals and gain of others, the most noticeable changes in fungicide usage were the increased use of captan, copper, mancozeb (Dithane), myclobutanil (Rally), ziram, and especially sulfur during the 2000 crop season. However, there was a reduction in the use of fenarimol (Rubigan), calcium polysulfide (lime sulfur), and triadimefon (Bayleton). The difference in sulfur and lime sulfur usage may actually be due to the way sulfur use was reported by respondents each year. For the 2000 survey, growers may have only listed “sulfur,” rather than specifying lime sulfur (calcium polysulfide), or may have included copper sulfate. A table comparison of Plant Growth Regulator and Nutrient spray usage during 1989 and 2000 is also available on the Website cited in the previous section. Apple management programs utilize PGRs for a variety of reasons including control of shoots and suckers, improvement of fruit shape, russet control, promotion of side branching, bloom promotion, fruit maturation, control of preharvest drop, and blossom or fruit thinning. Of all these listed uses, chemical thinning is the most common practice. The most frequently recommended thinning agents were: AVG (ReTain), sulfcarbamide (Wilthin), pelargonic acid (Thinex), 6-BA (Accel), NAD (Amid-thin), naphthalene acetic acid (NAA), carbaryl (Sevin), and ethephon (Ethrel). Other commonly used chemicals included plant hormones (cytokines and gibberellins). GA4A7 + 6-BA (Promalin) is used to improve the shape of fruit and GA4A7 (Provide) is recommended for russet control in Golden Delicious. The biggest change for a PGR from 1989 to 2000 was an increase in carbaryl use. (ED. NOTE: Carbaryl may be used, depending upon timing, as either an insecticide or a fruit thinner.) The average number of applications increased from 1.1 to 1.7 per acre, increasing the total pounds of AI from 96,000 in 1989 to 279,000 in 2000. Nutrients applied to the foliage are difficult to report because most respondents either wrote in a product name without indicating the purpose of its use, or indicated use in a vague manner, without naming the product. Since many products are formulated with several nutrients, the actual intended use cannot be easily assumed. The values reported in the surveys (available on the Website) are restricted to those nutrients that were fully disclosed. Those nutrients most noticeably absent from the survey for this reason are iron, potassium, and phosphorus. Also, the values for total nitrogen applied are underestimated. The 2000 survey shows that use of integrated and non-conventional approaches in apple pest management have increased over the past decade; over 90% of respondents use these practices. Orchard monitoring, pheromone traps, economic thresholds, and degree-day models are each used by more than 9 out of 10 growers, and use of alternate row spraying, biological control, and reduced chemical rates have all increased dramatically from a decade ago. The survey confirmed that growers rely heavily upon advice from trained field professionals and from WSU when making IPM decisions. While organic growers still comprise a small segment of the overall market, this production method has grown significantly. Codling moth is the most frequently cited insect pest in Washington apples, while powdery mildew is the leading disease. Leafroller, San Jose scale, and aphid are also significant insect pests, while leafhoppers and leafminers have decreased in importance over the past decade. The most notable changes in specific pesticides used over the last decade resulted from the loss of ethyl parathion, methyl parathion, phosphamidon, and propargite and the restrictions placed on azinphos-methyl. Petroleum oil comprised by far, 82% and 89%, the greatest amount of insecticides applied to apple in 1989 and 2000. The next most used insecticides were azinphos-methyl and chlorpyrifos. Carbaryl and endosulfan were among those insecticides showing great reduction in use from 1989 to 2000, while kaolin, diatomaceous earth, phosmet, and lime sulfur were not reported as used in 1989 but showed up in the 2000 survey. The main reason for the reduction in reported use of carbaryl (Sevin) from 1989 to 2000 was segregating its use to the plant growth regulator section in 2000. Carbaryl, while an insecticide by classification, is used primarily in Washington as a fruit-thinning agent so should not be included as an insecticide in surveys. Among fungicides, survey results show the predictable replacement of metiram and oxythioquinox by fosetyl-al, kresoxim-methyl, oxytetracycline, propiconazole, thiram, trifloxystrobin, and triflumizole, and increased use of captan, copper, mancozeb, myclobutanil, ziram, and sulfur. Several new insecticides and fungicides have been registered in the last few years and their use is just beginning to show up on surveys as growers become familiar with their pest control potential and researchers understand how to integrate them into IPM programs. The information presented in this report forms the baseline for evaluating future changes in IPM programs and points out the need to continue surveying and analyzing pesticide use patterns. More information and specific data from the 2000 survey can be found at Internet URL http://opus.tfrec.wsu.edu/~wjones/Survey2000/. 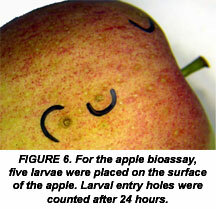 Watch for results from the pear and cherry surveys in a future issue of Agrichemical and Environmental News. Jay Brunner, Wendy Jones, Elizabeth Beers, Jerry Tangren, John Dunley, and Chang-lin Xiao are with the Washington State University Tree Fruit Research and Extension Center in Wenatchee. Gary Grove is with the Irrigated Agriculture Research and Extension Center in Prosser. Jay Brunner can be reached at jfb@wsu.edu or (509) 663-8181. Asquith, D. and L. A. Hull. 1979. Integrated pest management systems in Pennsylvania apple orchards. In: Pest Management Programs for Deciduous Tree Fruits and Nuts. [eds.] D. J. Boethel and R. D. Eikenbary. Plenum Press, New York. 203-222. Beers, E. H. and J. F. Brunner. 1991. Washington state apple and pear pesticide use survey, 1989-1990. Report to USDA-NAPIAP. Beers, E. H., J. F. Brunner, M. Willett and G. Warner. 1993. Orchard pest management: a resource book for the Pacific Northwest. The Good Fruit Grower, Yakima, Washington. Brunner, J. F., S. Welter, C. Calkins, R. Hilton, E. Beers, J. Dunley, T. Unruh, A. Knight, R. Van Steenwyk, and P. Van Buskirk. 2001. Mating disruption of codling moth: a perspective from the Western United States. IOBC wprs Bull. Vol. 25(1): 207-215. Calkins, C. O. 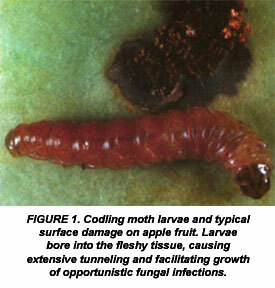 1998. Review of the codling moth areawide suppression program in the western United States. J. Agric. Entomol. 15(4): 327-333. Granatstein, D. and E. Kirby. 2002. Washington Organic Crop Acreage, http://organic.tfrec.wsu.edu/OrganicIFP/Home/WAOrgTreeFruit02.PDF . In: Organic and Integrated Fruit Production Home Page, http://organic.tfrec.wsu.edu/OrganicIFP/Home/Index.html . Smith, T. J., J. E. Dunley, E. H. Beers-Peryea, J. F. Brunner, G. G. Grove, K. M. Williams, F. J. Peryea, R. Parker, D. F. Mayer, C. Daniels, T. Maxwell, and S. Roberts. 2000. 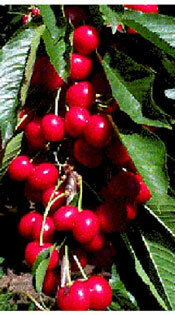 2000 crop protection guide for tree fruits in Washington. Washington State University Coop. Extension EB 0419. NASS. 2002. Agricultural Chemical Usage 2001 Fruit and Nut Summary. July 2002. USDA/NASS/ERS. NASS. 2000. Agricultural Chemical Usage 1999 Fruit and Nut Summary. July 2000. USDA/NASS/ERS. NASS. 1998. Agricultural Chemical Usage 1997 Fruit and Nut Summary. July 1998. USDA/NASS/ERS. NASS. 1996. Agricultural Chemical Usage 1995 Fruit and Nut Summary. July 1996. USDA/NASS/ERS. NASS. 1994. Agricultural Chemical Usage 1993 Fruit and Nut Summary. July 1994. USDA/NASS/ERS. NASS. 1992. Agricultural Chemical Usage 1991 Fruit and Nut Summary. July 1992. USDA/NASS/ERS. WASS. 2001. Washington Agricultural Statistics 2001. Wash. Agric. Statistics Service, USDA/WSDA, Olympia, WA. WASS. 2000. Washington Agricultural Statistics 2000. Wash. Agric. Statistics Service, USDA/WSDA, Olympia, WA. WASS. 1986. Washington Fruit Survey 1986. Wash. Agric. Statistics Service, USDA/WSDA, Olympia, WA. Once upon a time, a grower could make an honest living selling beautiful fruit across our country. Washington State growers were handsomely rewarded for providing an abundance of healthful commodities. But global realities and reduced markets have taken their toll; today, growers are just scraping by to make ends meet. As production techniques become ever more efficient, the result can be too much of a good thing. Market gluts naturally reduce prices, yet grower expenses keep going up. Ironically, growers are penalized the better they get. Is there a way out of this dilemma? The Washington tree fruit industry thinks so and the answer is reducing production costs through innovative technology. This strategy makes sense because production costs are the only part of the equation growers can control; they cannot affect the price of commodities. As the price of commodities continues to decline, the tree fruit industry has set a goal of reducing production costs by 30%. Labor and agricultural chemicals are major production inputs; cost savings in these areas will be critical in reaching this goal. Although full implementation of ecologically based integrated pest management (IPM) systems has the potential to dramatically reduce use of chemical controls, traditional pesticides will remain a main tool in any IPM system. Coincident with the pressure to reduce inputs, the Food Quality Protection Act (FQPA) has triggered reassessment of all pesticides. The organophosphate insecticides azinphos-methyl (Guthion) and phosmet (Imidan) remain the most reliable and least costly products for codling moth control (Figure 1). However, EPA during 2002 issued a time-limited tolerance for residues of these products on fruit (see “Adios, Azinphos-Methyl, Farewell Phosmet,” AENews Issue No. 191, March 2002, http://aenews.wsu.edu/Mar02AENews/Mar02AENews.htm#AZMPhosmet). Within four years, these pesticides could lose their registrations unless the manufacturers generate new information to refute EPA’s concerns about worker safety. Adding to the mix, the Endangered Species Act is bringing ecological concerns about these products into the mainstream. If our overall goal is sustainable production of safe and plentiful commodities, we must pay attention to input costs and all aspects of pest control, including insecticide resistance management. Maintaining the use of current chemical controls, but integrating them with the newer, reduced-risk products and codling moth mating disruption would be a step in the right direction. Thus, efforts need to focus on reducing use without sacrificing control efficacy. Sprayer technology, a comparatively neglected area of research, could help reduce pesticide costs while meeting increasing demands for environmental stewardship. The fine-tuning of sprayer technologies has the potential to reduce volumes of water, amount of active ingredient, and off-target drift. Furthermore, alternative sprayers (i.e., alternative to conventional airblast machines) may be better suited to precise targeting of the newer reduced-risk, low-application-rate chemicals and microbial pesticides. We see a need for increased research focusing on application technology. In particular, research should compare spray deposition from various sprayer types, characterize efficacy of reduced application rates using alternative sprayer technologies, and quantify resulting pesticide residues and their decline rates (i.e., residual efficacy over time). With funding from the Washington Tree Fruit Research Commission, we have been testing reduced application rates with a newer reduced-volume, air-assisted sprayer and comparing results to a conventional airblast sprayer (Figure 2). Specifically, we are determining whether insecticides used for codling moth control will still be effective if applied at half the rates recommended on the product labels. The Proptec sprayer is one example of a comparatively new sprayer technology that looks promising for saving growers time (which translates to labor expense) and money (through reduced rate of chemicals applied). The Proptec system employs a series of large fans mounted on a vertical boom (figure 2). Each fan surrounds the spray nozzle. The fans can be articulated at different angles so that the spray is directed precisely to the foliage. Another advantage of the Proptec is that the spray can be delivered using far less water (about 30-50 gallons per acre) than the conventional airblast sprayers (about 100-200 gallons per acre). Use of less water per acre sprayed will save labor and fuel by requiring less time out of the orchard for tank mixing and filling. Thus far, the Proptec sprayer has been most often deployed in vineyard production where the boom itself can be articulated to wrap around the trellised grapes. 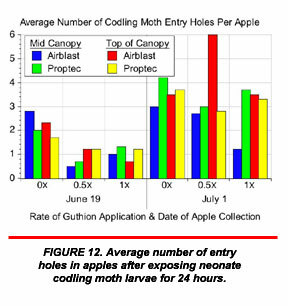 To test the hypothesis that reduced application rates can effectively control the codling moth and to compare the performance of Proptec and airblast sprayers, we defined experimental blocks in a commercial orchard west of Quincy, Washington (Figure 3). 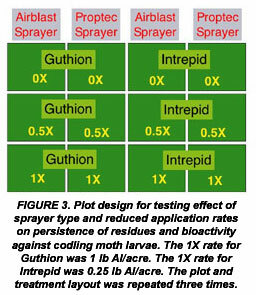 We sprayed plots with Guthion or the new reduced risk insecticide Intrepid (methoxyfenozide) at either the label recommendation rate (1X) or half of the label rate (0.5X). Afterward and throughout the growing seasons we collected foliage and apples from the middle and top of the canopy (Figure 4). To determine the effectiveness of the insecticides and their residual persistence, we bioassayed codling moth larvae by placing them in direct contact with the leaves and apples (Figures 5, 6). 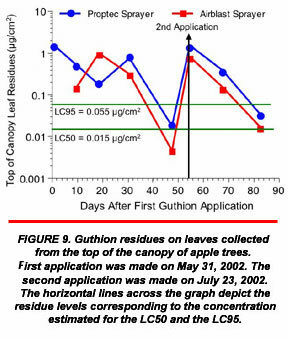 For the trees treated with Guthion, we also analyzed residues on leaf and apple surfaces. Finally, we determined the toxicity of the insecticides against codling moth larvae feeding on leaf surfaces (Figure 7). We’re still processing data at this writing, so I can only present our preliminary analysis of the results from trees treated with reduced rates of Guthion and compare the performance of the sprayers at this writing. 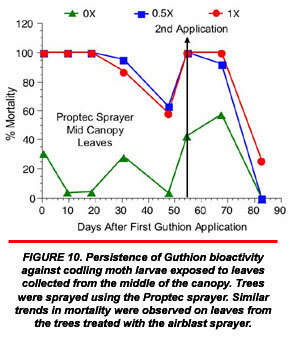 The airblast and Proptec sprayers gave similar distributions of Guthion residues, whether leaves were collected from the middle or the top of the canopy (Figures 8, 9). On most collection days, we did observe somewhat higher residues at the top of the canopy from the Proptec sprayer than from the airblast sprayer, but differences were not statistically significant. 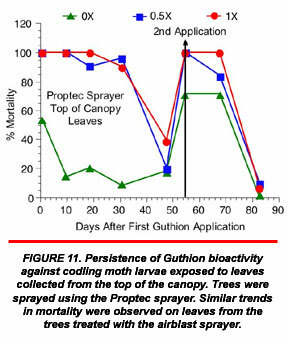 Guthion residues from the first application dissipated from leaf surfaces at about equal rates regardless of the sprayer that was used and the application rate. On the other hand, residues after the second application of Guthion seemed to decline more rapidly than after the first application (Figures 8, 9). Possible reasons include much higher temperatures in late July, which would increase volatilization, and greater frequency of overhead irrigation, which would increase wash-off from the leaf surfaces. 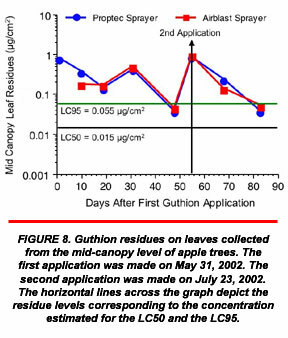 Guthion residues remained higher than the LC95 for at least 30 days after application (Figures 8, 9). As a rule of thumb, we expect residues above the LC95 to kill all of the larvae that come in contact with the pesticide. When we bioassayed the leaves from different collection dates, we observed that 90-100% of larvae died on samples collected 30 days after application (Figure 10, 11). However, many larvae survived on leaf samples collected about 30 days after the second application. Thus, the results from the codling moth bioassay and the residue analysis were consistent with one another. 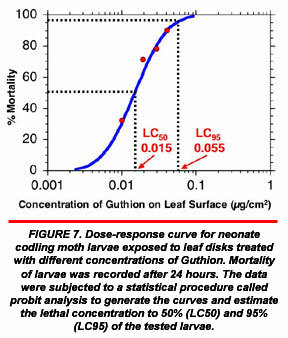 Most importantly, the reduced application rate of Guthion (0.5X) caused larval mortality percentages very similar to the full rate (1X) (Figures 10, 11). Although application rate did not affect how long bioactivity lasted, percentage larval mortality decreased more quickly after the second application than after the first, again coinciding with the dissipation rate of the residues. Efficacy of Guthion against codling moth larvae placed on apples did not last as long as residues on foliage (Figure 12). The test that we used was very conservative: five larvae were placed on the surface of the apple and then the apple was examined for entry holes. Efficacy seemed to decline dramatically after 20 days but differences between sprayers and location in the canopy did not affect ability of larvae to bore into the apples. One interesting and unexpected observation was larval mortality on untreated foliage. We had set up the experiment so that drift between plots would be minimized. However, commercial applications of Guthion were being made nearby in other parts of the orchard. Furthermore, residues left from the use of carbaryl (Sevin) as a fruit-thinning agent seemed to cause some larval mortality. This observation suggests the hypothesis that a grower who does not use insecticides but is surrounded by neighbors using them may reap some insect control benefits from either drifting residues or at least the reduction in the area wide codling moth population. This hypothesis may be worth further investigation considering the increasing numbers of certified organic fruit growers among the more conventional growers. We are continuing to determine whether reduced application rates can be just as efficacious as the label rates. One cautionary note is that some pesticide products may have strict prohibitions against using less than the label prescribed rate. However, many products do not have such proscriptions. These pesticides should be candidates for further research on reduced application rates. The potential cost savings could move growers from the red to the black while reducing environmental residues and worker exposure. Dr. Allan Felsot is an Environmental Toxicologist with WSU’s Food and Environmental Quality Laboratory. He is a frequent contributor to AENews and can be reached at (509) 372-7365 or afelsot@tricity.wsu.edu. We thank the Washington Tree Fruit Research Commission for funding and we are grateful that Stemilt Management Incorporated allowed us to use part of their commercial orchard. Linda Finch of the USDA-ARS in Wapato supplied codling moth eggs. WSU students Quentin Macdonald, Ruth Henderson, and Greg Boutain supplied the labor necessary to get the job done. Weed control in aquatic environments is a difficult proposition. The environments are sensitive, chemical alternatives are few, and the transport and dilution of chemical herbicides in water complicate efficacy and economy. Special concerns apply to fresh water, salt water, and estuaries (an estuary is the point where a freshwater river joins a body of salt water). Willapa Bay is a saltwater bay in Washington State that is separated from the Pacific Ocean by the 25-mile Long Beach Peninsula. The area in and around Willapa Bay is both an agricultural area and a natural recreation area. Commodities farmed here include cranberries and shellfish. Recreational activities include typical beach pastimes such as kite flying, camping, and bird watching. The area is home to the Willapa National Wildlife Refuge, 11,200 protected acres of marsh, forest, estuary, beach, and migratory bird habitat. Weed problems in and around the Willapa Bay area include Spartina (Spartina alterniflora) and parrotfeather milfoil (Myriophyllum aquaticum). While both of these plants can be useful in certain environments (Spartina meadows are valuable ecosystems in their native Atlantic and Gulf coasts and parrotfeather milfoil is an attractive aquatic landscaping plant), they are highly invasive and are considered noxious weeds by the Washington State Noxious Weed Control Board (http://www.nwcb.wa.gov/). 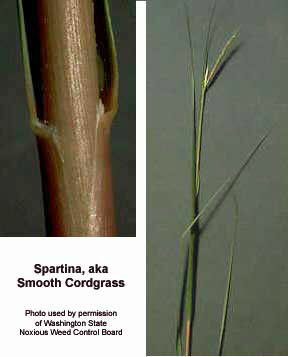 Spartina, also known as smooth cordgrass, is a perennial, deep-rooted saltmarsh grass that has proven to be a problematic invasive species in estuaries throughout the world. Willapa Bay is no exception; we have one of the world’s largest infestations here. Spartina is a very difficult plant to control; it re-sprouts each year from a dense, persistent root mass, spreading as a clone through horizontal underground rootstocks known as rhizomes. It also has the ability to disperse longer distances by way of broken root fragments and floating seeds. As rhizomes intermingle, circular patches of the plant grow together to form dense meadows that entrap sediments, physically raising the elevation of the tidelands. Marshes colonized by Spartina have exhibited build-up at rates from less than one inch to over eight inches per year, transforming mudflats into marshes and eliminating much of the upper part of existing tidal flats. Long-term ecological impacts of invasive Spartina marshes include drastic decline in shorebird populations, eelgrass beds, and waterfowl presence. The other significant weed we are dealing with, parrotfeather milfoil, is also known simply as “parrotfeather.” Where Spartina is an emergent (above-the-water) grass and thrives in the salty-freshwater environment of estuaries, parrotfeather is a submersed-emergent freshwater plant. 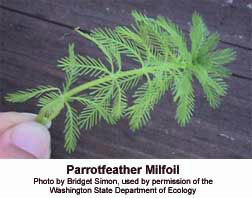 Parrotfeather’s emergent (above-the-water) leaves are an inch or two long, bright green, and have the appearance of a feather or a small fir tree. The submersed leaves are shorter, less distinctively green in color, and limp, often appearing to be dying. But appearances are deceptive, as parrotfeather stems can be very sturdy and healthy. This sturdy stem and the emergent leaves have a tough cuticle that resists penetration by herbicides. Like Spartina, parrotfeather forms dense mats of vegetation. These can quickly cover the surface of shallow bodies of water, affecting habitat and recreation and even causing flooding. The plant also provides ideal habitat for mosquito, a topical problem given this year’s concerns about West Nile Virus. Here at Washington State University’s Long Beach Research and Extension Unit, we have been working on controls for Spartina for over six years. This research has been supported in part by the Washington State Commission on Pesticide Registration and has been outlined in articles listed at the end of this essay. In 2002, we applied for and received a mini-grant from the U.S. Environmental Protection Agency (EPA) Region 10 enabling us to expand this research to include parrotfeather milfoil. My article in last August’s issue of Agrichemical and Environmental News discussed our rates of success with various chemical and mechanical strategies against Spartina as well as some of the environmental effects of these strategies. This article will concentrate on our parrotfeather research and the efficacy, fate, and persistence of one particular chemical strategy: imazapyr. 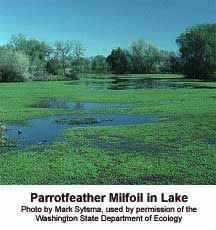 As with Spartina, parrotfeather milfoil control is limited by lack of effective tools. Mechanical control tends to be a poor option for parrotfeather because broken plant fragments spread growth of the plant. Biological control efforts have not been successful because herbivores do not like the tough cuticle or the high-tannin taste of parrotfeather. The only practical chemical control available is glyphosate, which is more of a suppressant than a true control, as it takes several years of repeated application to affect control on parrotfeather. It’s hard to employ integrated pest management when you do not have multiple control options to integrate with one another. We turned to imazapyr as a potential control option. To compare the efficacies of imazapyr and glyphosate, we established 12-foot-by-20-foot test plots in two drainage canal sites in Long Beach, Washington. We applied Arsenal (imazapyr) at 6 pints per acre and Aquamaster (glyphosate, same active ingredient and concentration as Rodeo) at 20 quarts per acre. Each was applied with an adjuvant (Agri-Dex and R-11, respectively). This application rate was employed both at regular volume-to-wet and at high volume-to-wet in two separate areas. We also applied a tank mix of Arsenal at 3 pints per acre plus Aquamaster at 6 pints per acre plus Agri-Dex. Applications were made on September 20, 2001, and October 1, 2001, and weed control was evaluated the following spring, May 10, 2002. Our initial test results showed that imazapyr provided excellent control of parrotfeather milfoil (Tables 1 and 2). Control was slightly better than glyphosate numerically, though the difference was not statistically significant. We plan to conduct additional research in the summer of 2003 to distinguish further between the two chemical treatments. Means followed by same letter do not differ significantly (P=.05, Student-Newman-Keuls). Of course, efficacy is only part of the picture when you are dealing with sensitive ecosystems. We have also been conducting experiments on the fate and persistence of imazapyr in aquatic environments. In late August 2001, we applied imazapyr at 1.5 pounds acid equivalent per acre to a plot of bare mudflat approximately 100 feet by 100 feet in the upper intertidal zone of Willapa Bay near the outlet of the Bear River. We made our applications about 1.5 hours after the tide receded from the site. We then collected water samples by burying one-liter jars in the mud so that only a small lip of the sample jar protruded above the surface. Jars were placed 0.3 meters, 6 meters, and 60 meters beyond (above) the upper end of the test plot. When the tide came in, 3.1 hours after treatment (HAT), we waited until the jars filled with incoming tidewater, capped them immediately, and removed the samples. We repeated tidewater collection at the second, third, and seventh tidal sequences at the 0.3-meter location (i.e., 3.5, 14, 28, and 77 HAT). We also collected sediment samples by pressing one-liter sample jars into the mud within the treatment plot. These we collected one hour after treatment (before the first incoming tide), then after the first, second, sixth, fourteenth, twenty-eighth, and fifty-sixth tidal sequences (i.e., 1, 14, 27, 77, 184, 366, and 703 HAT). When we analyzed our samples, we found that imazapyr exhibited a rapid rate of dissipation in both water and sediment after application to estuary mud (Figures 1 and 2). The quantity of imazapyr remaining in the water approached zero by forty hours after application and the quantity remaining in sediment approached zero by four hundred hours following application. Water collected at 6 and 60 meters outside the spray zone at the first incoming tide showed an imazapyr concentration equivalent to water collected at the seventh tide at the immediate edge of the spray zone. When water was removed from the sediment samples taken at the first and twenty-eighth tidal sequences, this interstitial water was found to contain slightly less imazapyr than the sediment itself. Imazapyr shows promise as a control option for the noxious aquatic weeds Spartina and parrotfeather milfoil. Our work with this chemical is timely, as EPA is scheduled to conduct its review of imazapyr for aquatic registration in the third quarter of this year. 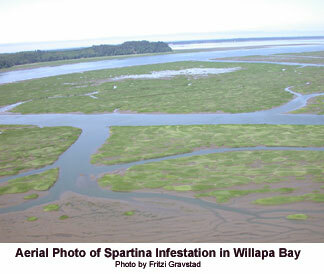 We are seeking a Special Local Needs (SLN, 24c) registration for Spartina control in estuary use in Washington State in 2004 and a Federal Experimental Use Permit (EUP) to conduct research on 100 acres in Willapa Bay in 2003. Washington State Department of Agriculture has contracted out a supplemental Environmental Impact Statement review for imazapyr, which will be done in June 2003. Dr. Kim Patten is with Washington State University in Long Beach. He can be reached at (360) 642-2031 or pattenk@cahe.wsu.edu. Items in this section often appear in the words of the sponsoring organization or original news release. AENews editorial staff is not responsible for the accuracy of the content. In response to a 1998 request by the U.S. Department of Agriculture's Office of Pest Management Policy (USDA/OPMP), each state is producing documents called "Commodity and Pest Management Profiles" or "crop profiles" for short. Washington State's crop profiles are available in an easy-to-read, printable PDF format at http://wsprs.wsu.edu/CropProfiles.html. Crop profiles provide a basic outline of the production and value of a particular crop and a detailed description of current pest management practices for that commodity. They are used at the state and federal level to assist in making decisions affecting pesticide registrations. 1) Washington State University Cooperative Extension has launched a comprehensive Website on West Nile Virus at http://wnv.wsu.edu/. The site includes general information on the disease and its vectors, a calendar of WNV-related events, lists of resources both general and specific, and links to futher information. 2) King County has a West Nile Virus Website at http://www.metrokc.gov/health/westnile/. Here, you can sign up for email alerts, read press releases, and access WNV and other public health information pertinent to the King County urban area. 3) A West Nile Virus Hotline telephone number has been established by King County Public Health at 1-206-205-3883. The hotline is presented in your choice of English or Spanish. Topics provided at this writing included information on signs and symptoms of WNV, on reporting dead birds, on reducing mosquito habitat, on dealing with mosquito bites and reporting suspicious bite incidents. Basic information on transmittal of the virus is given in a recorded format on this hotline. 4) Washington State Department of Health's West Nile Virus Website is on-line at http://www.doh.wa.gov/ehp/ts/Zoo/WNV/WNV.html. Documents available from DOH include "West Nile Virus Surveillance in Washington State," a 15-page report documenting counts of mosquitoes, birds, affected horses, and affected human surveillance, which be downloaded as a PDF at http://www.doh.wa.gov/ehp/ts/Zoo/WNV/WestNileVirusSurv.pdf and the detailed "Mosquito-Borne Disease Response Plan," a 132-page document released November 2002, which can be downloaded as a PDF at http://www.doh.wa.gov/ehp/ts/Zoo/WNV/WAArboviralRespPlan.pdf. A reprintable (both low- and high-resolution formats) brochure, "Do You Know What's Biting You?" is also available from DOH at http://www.doh.wa.gov/here/CRA/CRA_detail.asp?ID=316. Washington, Seattle, along with the Center for Occupational and Environmental Health at UC Berkeley. The program themes include sessions on injuries and ergonomics, illnesses and diseases (including respiratory diseases and pesticide illnesses), and health and safety challenges faced by farmworkers. A special feature of this year's conference will be breakfast discussion tables focusing on specific issues. Here is a chance to join in lively and informal discussions on topics of particular interest to you and meet others with similar interests. More information, including poster submission details as they become available, can be found at http://agcenter.ucdavis.edu/Announce/AgChallenges2003.php. The Washington Pest Consultants Association (WaPCA) has been involved in recycling plastic pesticide containers since the early 1990s in Washington State. Northwest Ag Plastics, Inc. is contracted to operate the recycling program. A cooperative venture of Washington State University and the University of Idaho, this conference program will include "Pathogens du jour" (environmental persistence of Listeria, E. coli O157:H7, Noroviruses, and prions), "Pathogens and Fresh Produce," "Food Handling Behaviors" (at home, in the workplace, and abroad), and "Hot Topics in the News." Registration forms will be available later this month. To receive one, or for more information, contact WSU at ceeps@wsu.edu. Major topics include "Precision Operations and Equipment," "Remote Sensing and Measurement of Forest Lands and Vegetation," "Terrestrial Sensing, Measurement and Monitoring," and "Design Tools and Decision Support Systems." Early registration at a substantial savings must occur before April 4, 2003. University and University of Washington.